All-purpose, medium strength threadlocker. Ideal for all nut and bolt applications 1/4 inch to 3/4 inch (6mm to 20mm). Eliminates need for stocking expensive lock nuts and lock washers. Locks and seals while preventing parts from loosening due to vibration. 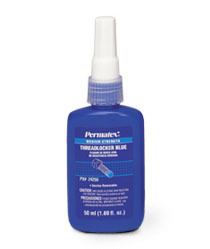 Protects threads from corrosion. Removable with hand tools for easy disassembly. Mil-Spec (S-46163A) Type II, Grade N.
Mil-Spec (S-46163A) Type II, Grade N.